These species are recognized as small marine fishes belonging to the Zanclidae family. They obtain the names from the African Moors where they can be popularly found. They can be spotted in the sub-tropical and tropical regions and habitat in reefs and lagoons as well. They are very popular in the Indo-Pacific region. 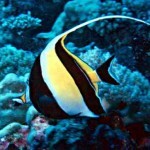 Moorish Idols are the only living member of the Zanclidae family and have an isolate specimen. These species become aggressive when they are provided with little water but are otherwise very timid while, especially while eating in front of other species. 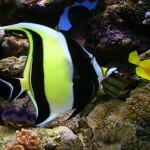 These species have white, yellow and black ribbons on the muzzle and hence make a great aquarium fish. One can spot these species in the parts of East Africa, Ducei Islands, Indian Ocean, Southern Japan, and Hawaii. Infact they can also be found in the Southern Peru and California. However, they are natives to the regions of the Indo Pacific. 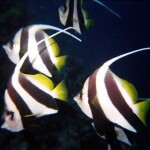 Length of Moorish Idol: The size of these species is about 9 inches in length. 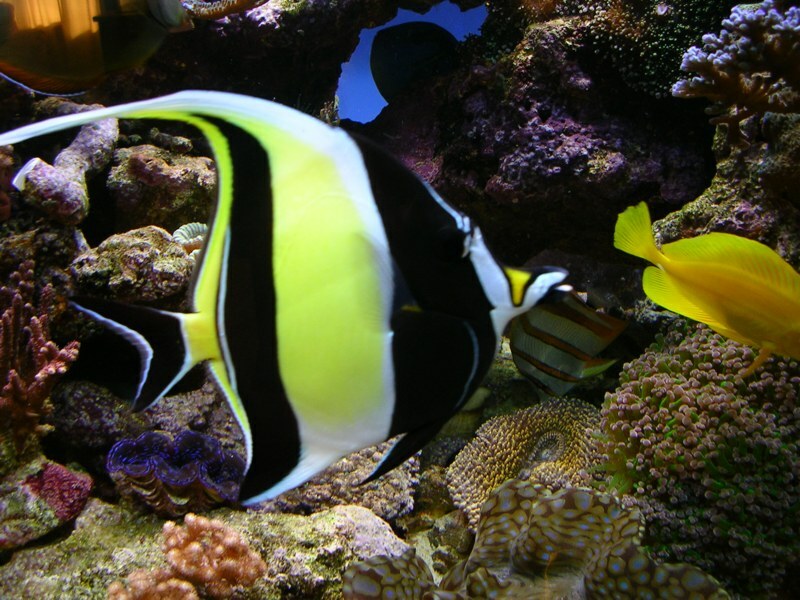 Color of Moorish Idol: These species are very colorful and have alternative bands of white, yellow and black. 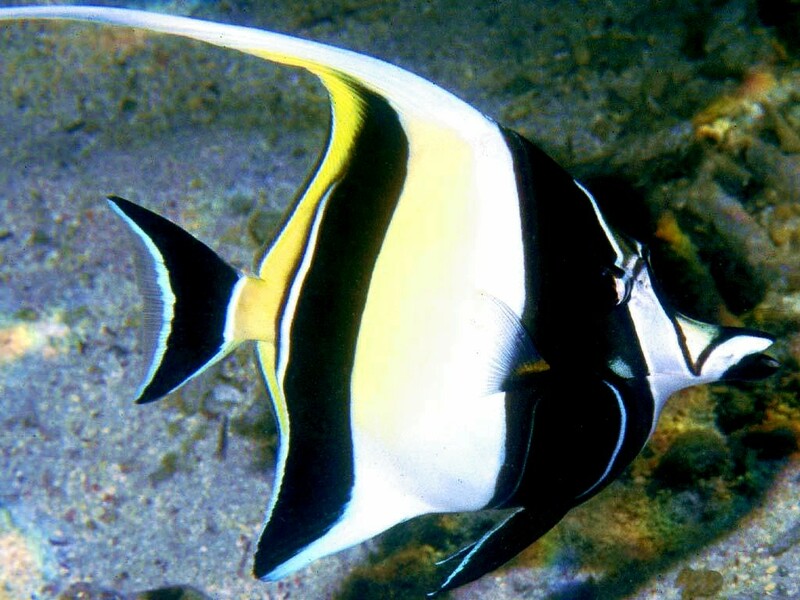 Weight of Moorish Idol: The weight of these species varies from 1.5 – 3 lbs. 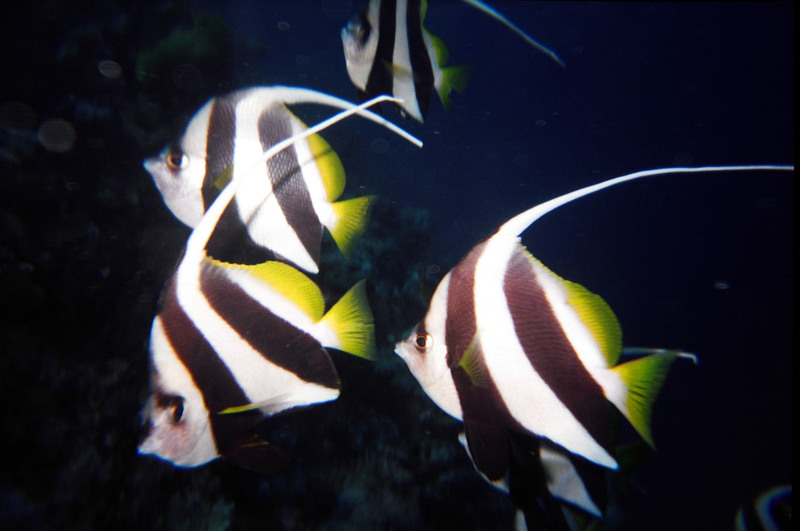 Fins of Moorish Idol: These species have dorsal fins that are long and white. Mouth of Moorish Idol: These species have small mouths with a long tubular snout. They have bristles shaped teeth within it. 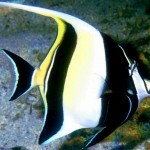 Shape of Moorish Idol: They possess a striking and unusual circular shaped body. They are quite sensitive to the water. In the night one can often see them clinging to reef bottoms. These species are very periodic by nature and prefer to stay in groups. These species like to swim in groups. However, they are frequently seen fighting against each other. One can also spot them moving around with the larger invertebrates. 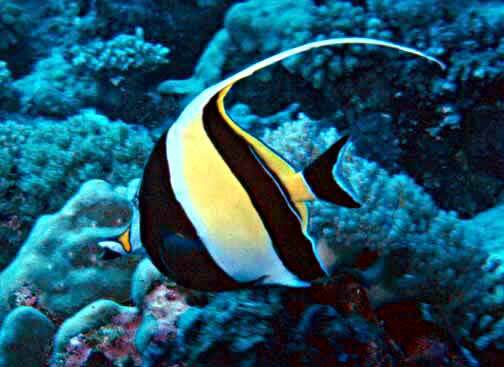 The Moorish idol feels embarrassed to eat in front of others. These species are very selective while taking food but by nature, they tend to be omnivorous. They generally feed on brine shrimp and vegetable foods as their diet. Moorish like to graze but are very timid while eating in front of others. They usually eat about twice or thrice a day. These species prefer to inhabit in the regions of the Indo-Pacific and Pacific regions. Other preferred locations include the reefs and lagoons. The main predators of these species are the Moray Eels and Tomato Crowns. The body color of these species really can fluster the victims. These species have long streamer that is again one interesting adaptation for determent of predators. Nothing much has been inferred about the mating period of these species in the wild. These species are the pelagic type. They generally lay sperms an eggs in the water areas. These fishes tend to be very impressive because of their larval structure. They generally acquire a size of 7.5 cms prior becoming a good young swimmer. The life cycle of these species is pretty interesting. They prefer to spend a lot of time on the surface of the ocean once they hatch from a planktonic egg. As they grow, they begin to settle on the reef. Proper Aquariums: These fishes prefer to remain active and moving and hence giant tanks that can hold at least 100 gallon water should prove to be ideal. These species are very shy by nature but tend to be very destructive if the size of the aquarium is low. However, the fish does not survive very long. Characteristics of Water: They inhabit in the salty water. One can spot them moving swiftly anywhere around portraying strong swimming abilities in salt waters. Temperature of Water: The Ph balance of the water should be well maintained within 8.2 to 8.6 while the SG should be about 1.020 to 1.023. These species can ideally live for about 2 to 4 years.